Dr. Timothy “Danny” Mack earned his Doctor of Optometry degree at The Ohio State University College of Optometry in Columbus, Ohio. During his training, he gained valuable experience in a variety of clinical settings throughout Ohio, Kentucky, and Utah before establishing himself in Hawaii. For three years Dr. Mack lived and worked on the island of Oahu, where he rose to the position of Chief Medical Optometrist working for one of the largest ophthalmology groups in the Pacific. Dr. Mack has a heart for service and has volunteered his skills on eye care missions throughout the Hawaiian Islands, Fiji, and Honduras. During his education, he spent over six months studying in Central America and is fluent in Spanish. During his time in Hawaii, he was a staple in the local community through many leadership roles in his church, including serving as senior leader in the high school ministry program. Though he enjoys travel, Dr. Mack moved back to the mainland and settled in Charlotte to live closer to family and grow roots in the community. Committed to joining Dr. Laura Young in her mission to deliver the highest quality eye care in the region, Dr. Mack performs comprehensive eye examinations and is therapeutically certified to manage ocular diseases including pink eye, diabetes, and glaucoma. 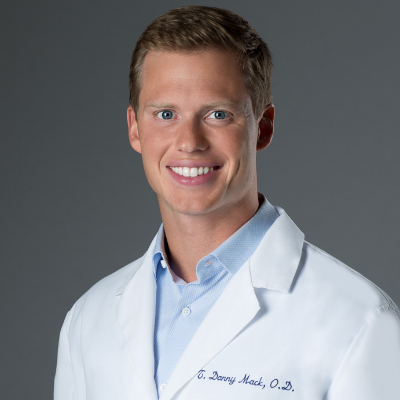 He has extensive experience in the treatment of chronic dry eyes, refractive surgery co-management, and fitting contact lenses for patients of all ages and lifestyles. He is an active member of the North Carolina Optometric Society, Hawaiian Eye Foundation, and the American Optometric Association.